Oil and water. Alligators and household pets. These things do not go well together. Neither do two economists with irreconcilable financial theories. In this article, writer Robert Folsom explains that a deeply mixed social mood prompted the Nobel committee to award the 2013 Nobel Memorial Prize in Economic Science to two academics – Eugene Fama and Robert Shiller – who hold incompatible economic perspectives. Here is an excerpt of Folsom’s January 2014 article. … investor attitudes are of great importance in determining the course of speculative assets. Prices change in substantial measure because the investing public en masse capriciously changes its mind. The curiosity of Fama and Shiller as simultaneous Nobel recipients did not go unnoticed in the media. … Yet if some commentators at least noticed that Fama and Shiller were “the oddest of bedfellows,”none even attempted a thoughtful explanation of why the Nobel committee gave equal recognition to utterly incompatible schools of financial thought. In the remainder of this packed, three-page report, Robert Folsom provides two more socionomic truths that illuminate the Nobel committee’s unusual choices. 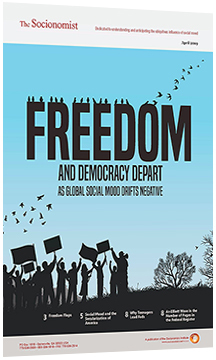 Continue reading to discover how the social mood influenced the committee’s October 2013 decision, as well as its selections for the past forty years.